Do you want to refresh and brighten your skin and moisturize and shine your hair for all of your upcoming holiday parties? But you also don’t want to use any harsh ingredients or chemicals? We’ve got you! Here are some DIY face and hair masks that you can make from ingredients in your kitchen. Berry face mask. This is great for brightening your skin. Mix together two tablespoons of yogurt, two tablespoons of honey, ¼ cup of mixed berries (whatever you have, think raspberries, strawberries and blueberries) and one tablespoon lemon juice. Combine in a blender and then apply to a clean, dry face and leave on for 10-15 minutes then rinse. Orange face mask. Combine ½ cup of steel-cut oatmeal, one orange, three tablespoons of greek yogurt, two tablespoons of honey and two teaspoons of dried orange peel. Spread onto a clean, dry face and leave on for 15-30 minutes then rinse with warm water. Mocha Frappuccino mask. This is a great brightening and exfoliating max. Mix together ½ cup of ground coffee beans, ½ cup of unsweetened cocoa powder, one cup of unsweetened milk, one tablespoon of lemon juice or almond oil and one tablespoon of honey. Leave on face for about 20 minutes and then rinse, scrubbing as you rinse off. 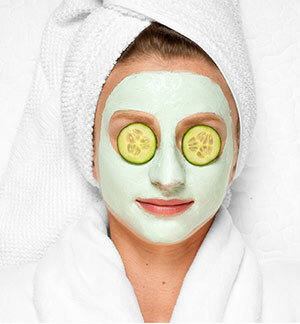 Cucumber mask. Perfect for dry, tired skin. Just blend together ½ of a cucumber and a tablespoon of yogurt. Apply to face and leave on for about 15 minutes, then rinse with cold water. Strawberry face mask. Mash 8-9 strawberries until smooth then add two tablespoons of honey, one tablespoon of oil (almond, olive, jojoba or grapeseed), and a few drops of lemon juice. Apply to face and leave on for 5 minutes. Rinse with warm water. Banana face mask. Mash one ripe banana with a fork then mix in one teaspoon of honey and one teaspoon of lemon juice. Apply to a clean, dry face and let sit for about 15 minutes. Then rinse off with warm water. Mint face scrub. You can make your own face scrub using ½ cup of coconut oil, ½ cup of white sugar, one tablespoon of grapefruit juice, grapefruit zest, 10 drops of peppermint oil and 25 drops of grapefruit oil. First, mix the coconut oil and sugar to form a thick paste. Then mix in the rest until it is all blended. Store in an airtight container. Strawberry hair mask. This is a great mask if you suffer from dandruff or your hair is falling out a lot. All you need to do is puree 5-7 strawberries, depending on how long your hair is, add a tablespoon of honey and a table spoon of coconut oil and mix until smooth. Apply to damp hair and leave on for about 30 minutes. Then rinse out. Your hair will smell amazing too! Avocado, honey and olive oil hair mask. If you have frizzy hair, this mask is for you! Just take one avocado, one tablespoon of honey and two tablespoons of olive oil and blend well. Of course, remove the seed and skin of the avocado first! Add peppermint oil for a nice tingling sensation. Apply to hair and wrap with plastic wrap or a plastic bag and leave on for one hour. Then rinse well. Apple cider vinegar, almond oil and honey mask. This works well for split ends or dry hair. Mix one tablespoon of apple cider vinegar, one tablespoon of almond oil and two tablespoons of honey together. Apply to hair, focusing on your ends. Leave on for 30 minutes and then rinse. Coconut mask. This is great for deep conditioning dry hair. Mix a ripe avocado, ½ cup coconut milk and three tablespoons of olive oil together. Apply to hair and leave on overnight or at least 20 minutes if you’re in a rush. Rinse and shampoo after. Beer hair mask. Beer is great to help thicken your hair! Mix together a ripe banana, one egg, ½ cup of flat beer and a tablespoon of honey. First mash the banana and then mix in the egg until it becomes smooth. Add the beer and honey and mix well. Apply to scalp and massage for 5 minutes then allow the mask to sit for an hour. Then rinse and shampoo. Honey hair mask. This is great for dry hair or brightening up a blonde. Mix a ½ cup olive oil, two tablespoons of honey, 2 tablespoons of lemon extract, the juice and pulp of a lemon and two tablespoons of wheat germ. Put on dry, dirty hair and leave on for about 30 minutes. Comb the mixture through your hair, shampoo and condition it out after. Do you ever make your own face or hair masks? Which one are you excited to try? Share with us!